Okay, here we go again. Just like Merry & Pippin and their 2nd breakfast, I was about to embark on another night of the Signature Dish Dining Festival food tour with our 2nd and 3rd dinners. Much like the pig-out session I did last time in Richmond, we were doing 3 restaurants in Burnaby. Although Burnaby doesn't even hold a candle to Richmond's outstanding selection of Chinese restaurants, they seemed to have picked 3 good ones for the tour. Great, I thought. One less restaurant than last time, hence less food? Yah, wishful thinking on my part. When I arrived at our first destination, I quickly learned that the number of restaurants was insignificant when they start serving more dishes! So this was exactly the case at Alvin Garden. The owner was so gracious, she took requests which bumped our dish total to 10. Uh... After this full meal, we were to go eat again at 2 other restaurants? Oh man... And why exactly are we doing this? 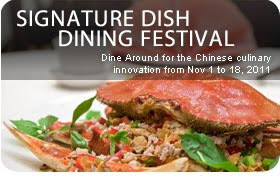 For those who didn't read my Richmond post on the Signature Dish Dining Festival, this is part of the Chinese Restaurant Awards where restaurants do a sort of Chinese "Dine-Out" with set menus at some pretty reasonable prices. 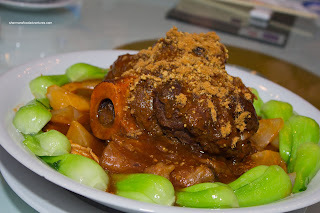 For me, I was lucky enough to be part of it and got to try some of the best Chinese dishes in the city. 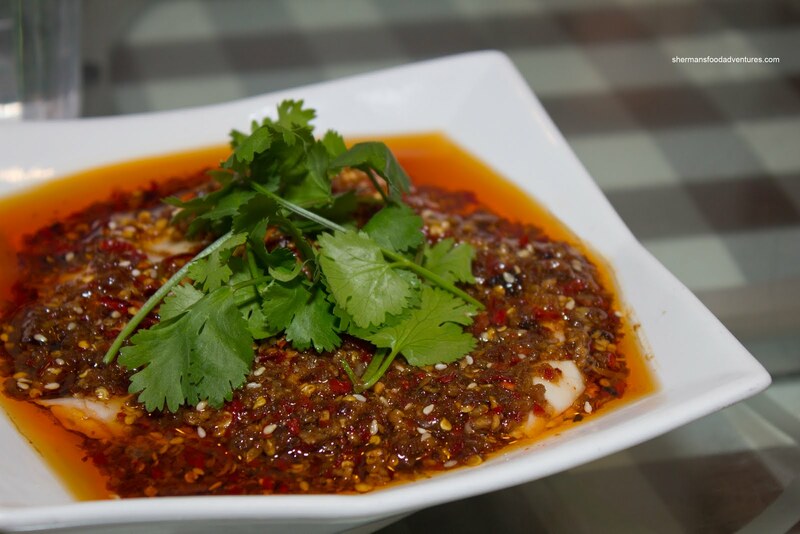 Our first dish at Alvin Garden was their Award-Winning Hunan Smoked Duck. Smoked with Pu'er Tea or Bo-Lay as I know it, the duck had a good amount of flavour that didn't mask the inherent gaminess of the meat. This, combined with meaty, yet tender flesh made for a great smoked duck. 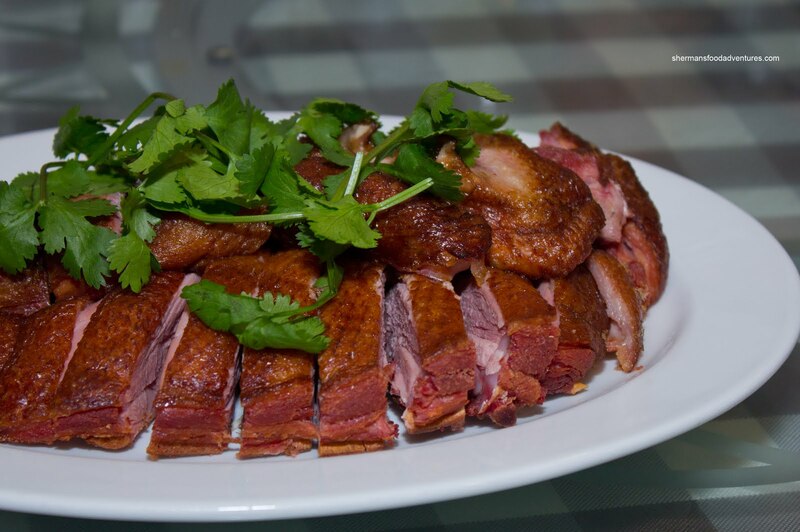 Too many times, smoked duck can be dry and too salty. Not in this case. 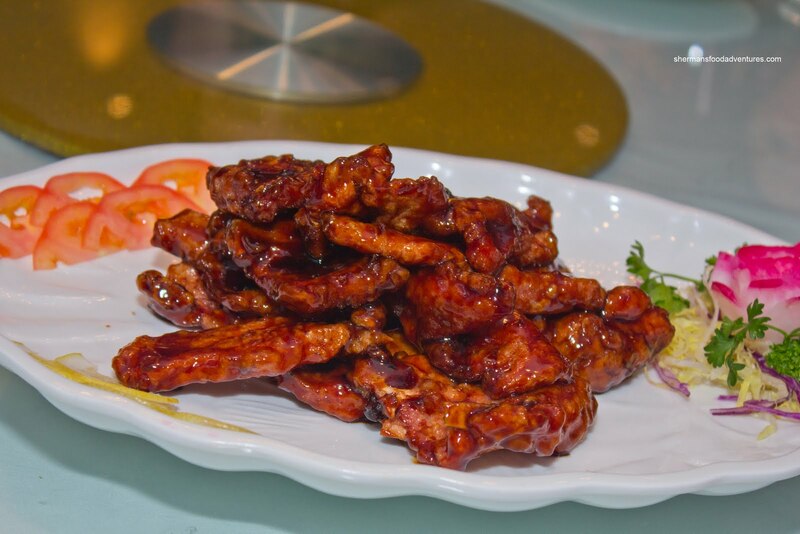 Next up was the Spicy-Flavoured Chicken which was essentially shredded poached chicken doused in a chili oil hot sauce. Despite looking like a bowl of fiery hot food, this was merely all bark, no bite. We would later learn that they had prepared the food at 1/5th of the regular spice level (so not to scare or maim any media members). That was bit disappointing for some, including myself, but I can see why they did it. As for this dish, the chicken was almost jelly-like in texture due to the perfect poaching and immediate cool down. The chili oil sauce on top was a bit nutty, a touch vinegary and only mildly spicy. 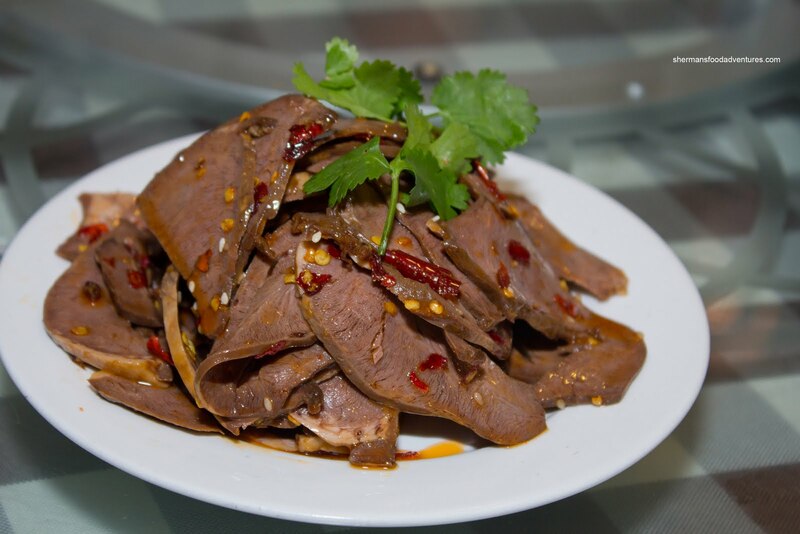 One of the requested dishes from our table was the Sliced Pork Heart with Five Spices tossed in chili oil. Hot damn, I was pretty happy with this special dish. 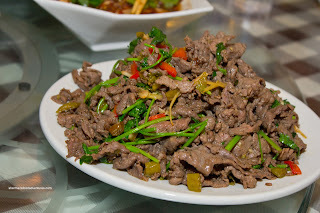 I love offal and especially spicy offal! Well, this was prepared very well. The texture of the heart slices was chewy while easy to eat. In addition, the slices were the right size, which may seem trivial, but is essential for eating enjoyment! It was very mild-tasting with classic 5-spice flavouring, yet again, it was due to the conservative spice level. 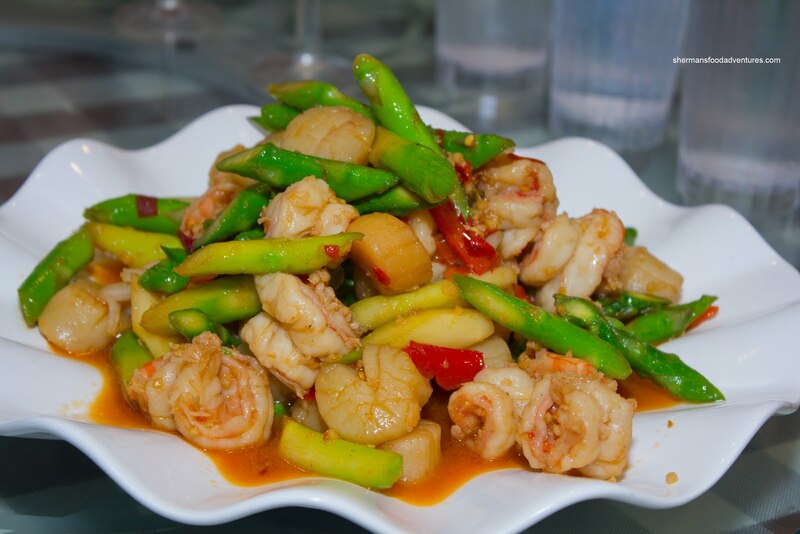 One dish that I thought could've been better was the Stir-Fried BC Prawns & Scallops with asparagus. Although the scallops were just barely cooked, the prawns almost a ppeared to be boiled. Either the wok heat was slightly lacking or there was too much moisture (as evidenced by the liquid at the bottom of the plate). On the other hand, the seafood could've been water-blanched first which would explain everything. I found the prawns to be a touch rubbery and visually, they were not all that pleasing. However, I did like the flavouring agents. There was a good combination of garlic, sweetness and a touch of spice. Moreover, the asparagus was still crunchy. Yet another dish that was not on our menu for the tasting was the Home Made Tofu with Pork. Nothing really interesting about this dish other than the nicely textured fried tofu (which was the right balance between being dense, but not too dense). The rest of the items (peppers, wood ear mushroom and pork slices) were pretty typical. Okay, someone please enlighten me here. Although the Cauliflower with Alberta Pork arrived plated in an interesting pan situated atop a wooden basket, the dish itself was boring. 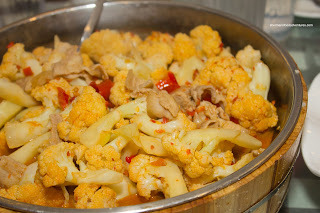 What we got was some cooked cauliflower with overdone pork. In addition, the bottom of the pan was watery. Hence, any hint of spice (which was dumbed-down for this meal) was washed out. This was very "meh" to me at least. As for the next dish, I was really not sure what it was. I mean, I could tell it was beef with cilantro, peppers and pickled vegetable, yet it did not completely correspond with any of the menu items. So, I'm only guessing that it was the Stir-Fried Beef with Pickled Green Chili? Why the confusion? Well, the predominant flavour for me was the cilantro combined with some spice. Was it from the pickled green chili? Could be, but it was overshadowed by the cilantro. The meat was tender and not dry (despite its appearance) though. 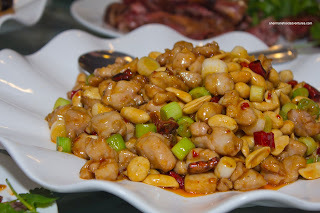 One of my favourite dishes here was the Stir-Fried Spicy Chicken with Peanuts and Amoy dark soy sauce. Really good wok heat in this dish as illustrated by the the great colour and lack of moisture on the plate. The chicken was tender and full of flavour while the crunchy peanuts was the textural contrast. Once again, the reduced heat level of the dishes prevented this dish from being a home-run. Moving along to the Pan-Fried Green Beans with Mince d Pork, we were treated to just slightly past crisp oil-blanched beans. 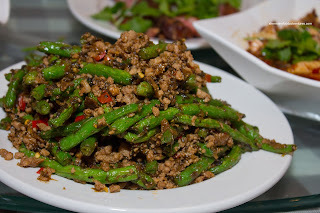 The combination of easy-to-eat minced pork, chili peppers and pickled vegetable provided a mix strong flavours. Once again, this was fairly mild, so there was no "pop", but that was the intention. 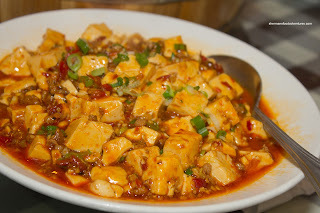 Now, even with a "dumbed-down" version of their Ma Po Tofu, I still found it to be very good. 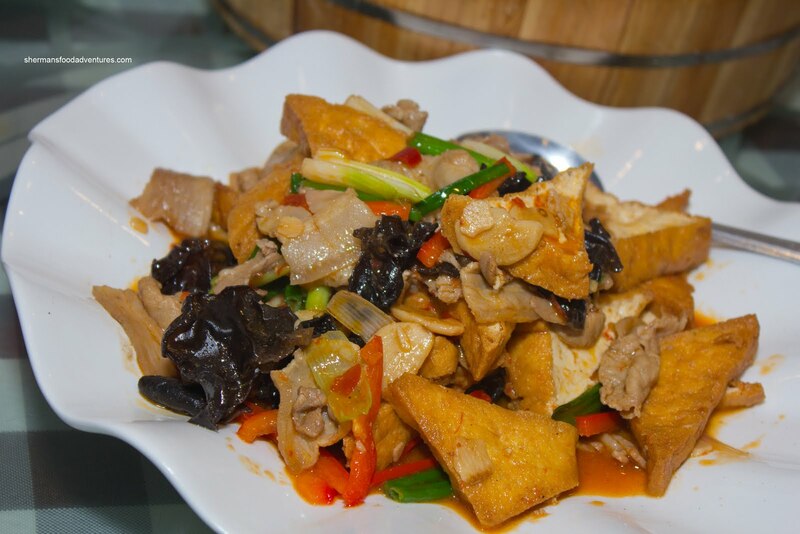 Despite being soft and almost silky, the tofu retained its shape. Furthermore, there was no pool of liquid other than the slightly spicy meat sauce. We needed to get some rice for this, which ultimately soaked up the tasty flavours. Finally at the end of the unexpected 10 dish foray at Alvin Garden, we headed over to Metrotown for our second restaurant - Fortune House. With a much more sane menu (fewer items! ), we had the Deep Fried Crab Claw stuffed with Shrimp. 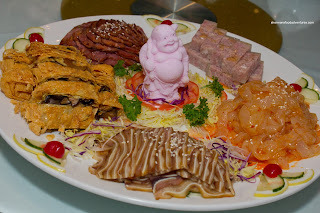 This is a typical offering seen at Chinese weddings and baby one-month dinners. These were served on individual plates with a side of fruit salad. The exterior was fried perfectly crisp without being chewy (this happens sometimes and makes it hard to bite). Inside, the minced shrimp was sweet and had a nice snap. For me, I'm not a huge fan of mayo and fruit, so I was indifferent about the fruit salad. However, the mayo went really well with the claw. Call it a Chinese-version of ebi mayo... We were presented with an appetizing plate of Sauteed B.C. Geoduck with Asparagus and Pine Nuts next. Personally, it was a treat to see geoduck on the menu since I haven't had it in awhile. Gosh, these mollusks used to be 99 cents a pound. Before it became a staple in Asian cuisine... 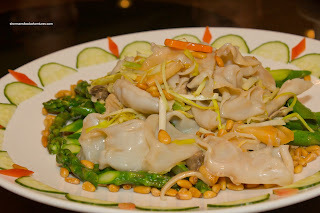 The thin slices of geoduck in the dish were sweet and crunchy. It is very important not to overcook geoduck as it will take on the properties of rubber. The accompanying asparagus was vibrant in colour while still crisp. Not sure how the pine nuts worked in this dish, but I love pine nuts, so I really didn't care. 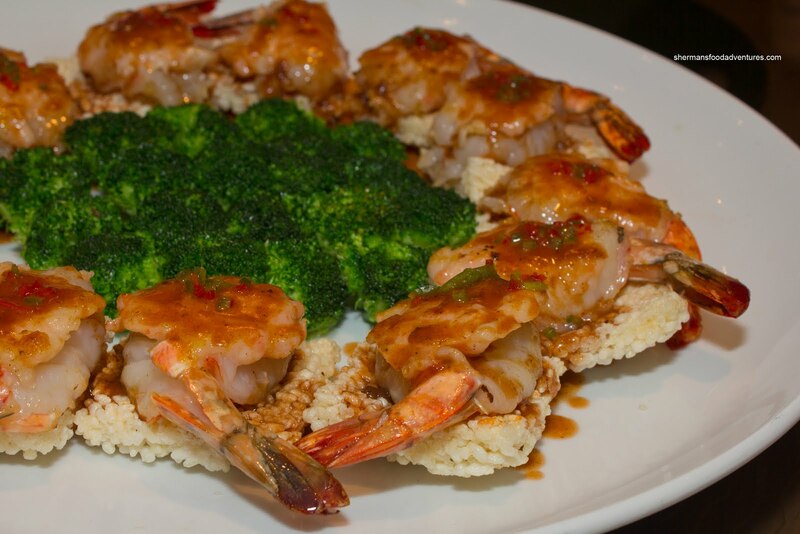 Continuing with the seafood theme, we were treated to an impressive plate of Pan-Fried Jumbo Prawns with Spicy Hawthorn Sauce. These huge suckers were sweet and meaty. One bite into them and yup, that was what we all crave from prawns - that lovely snap and crunch. So good. The hawthorn sauce was sweet with a nice zip. 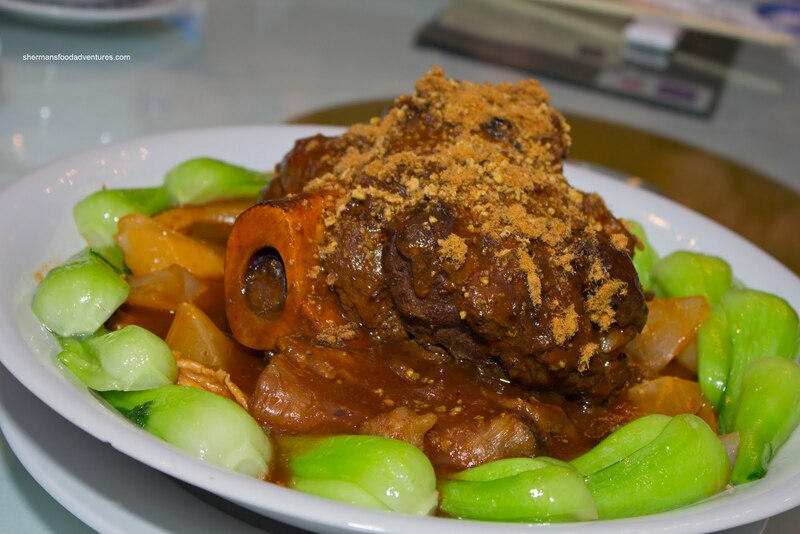 For those who grew up eating haw flakes, you will be well-versed in the flavour profile of this dish. Yup, haw flakes come from the fruit of the Chinese hawthorn plant. Moving away from seafood, we had the Pan Fried Alberta Beef Tenderloin with roasted walnuts in bird's nest. This was a pretty straight-forward stir-fry. The beef tenderloin was predictably moist and tender, especially since it was cooked just right (as in slightly past medium rare). There was a nice sear on the outside which added flavour while the veggies were colourful and crunchy. We were served a portion of the bird's nest as well and it was still fairly crispy despite the moisture from the food sitting atop of it. 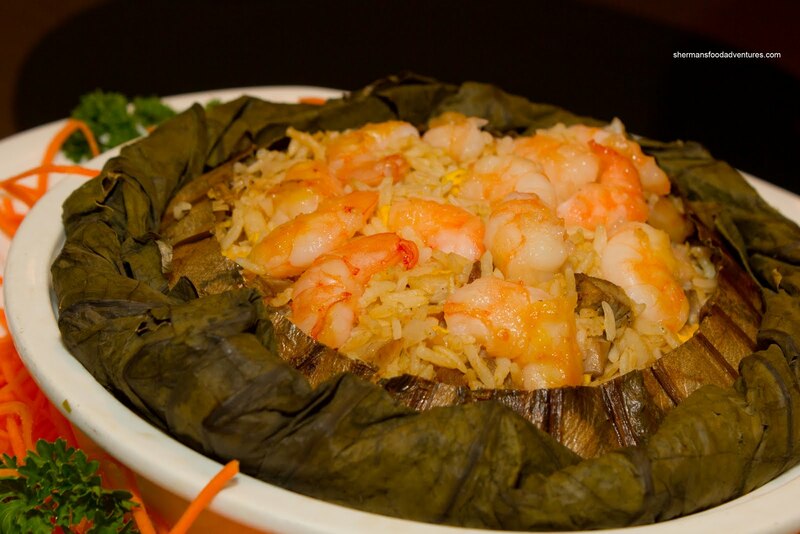 Our last savoury item at Fortune House was the Fried Rice with shrimp and dried scallops encased in lotus leaves. Prior to them opening up the lotus leaf package, it resembled a circus top, which was quite neat-looking. We were served a bowl of rice each and I found it to be fragrant from the dried scallops and influence of the lotus leaves. However, it could've stood to be a little less dry. As mentioned, the dried scallops were quite prominent as a flavouring agent while the shrimp only served as a texture more than anything. For dessert, it was a pleasant surprise that we got something a little different than the usual. 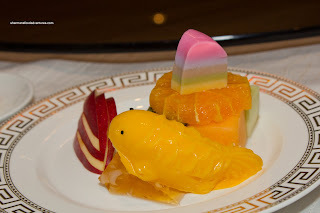 The Five Flavour Rainbow Pudding, as offered on their menu for six and Mango Pudding, as offered in their menu for four, were interestingly plated with fresh fruit. Chinese desserts will never be in the same class as say... French desserts, but at the same time, I appreciate their attempt at being more creative. In terms of flavour and texture, the pudding was pretty good. Nothing Earth-shattering, but pleasant nonetheless. 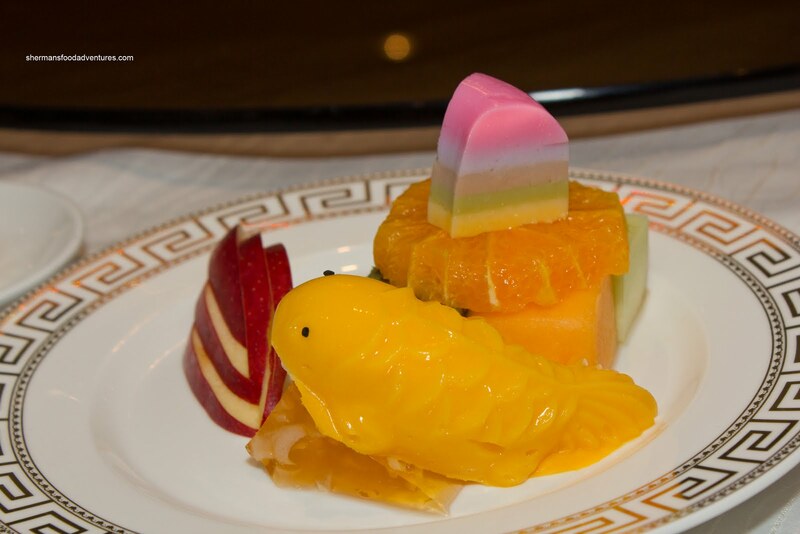 On the other hand, the mango pudding shaped as a koi fish exhibited plenty of real mango flavour. As I waddled my way out of Fortune House, I was preparing myself for our 3rd meal at Grand Dynasty. 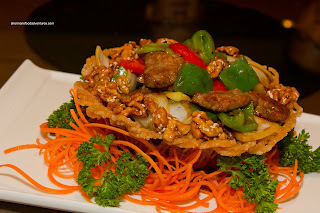 The newest restaurant of the 3, Grand Dynasty is located in the Villa Casinos complex near Hwy 1. We were presented with the Signature Cold Cut Platter to begin. Similar to the one we had at Northern Delicacy, in terms of both plating and items, the bean curd skin roll was a bit different being fried. I like both versions, however, the fried one is naturally more oily and less healthy. The other items on the platter (clockwise from the bean curd roll) were sliced beef shank, jellied pork, marinated jellyfish and pig's ear. Not everyone was as enthusiastic about the pig's ear as much as I was. If I had to make an analogy, think of it as a form of head cheese, except for the cartilage. 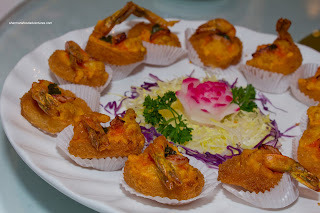 Then, a platter of what I though was shrimp toast arrived. In fact, the menu name was Pan-Fried Prawn Dumplings with Custard Powder. Okay... whatever, to me these were a high-class version of the long-forgotten Dim Sum dish of shrimp toast. Rather than minced shrimp meat, there was a whole prawn sitting atop a round piece of toast. Deep-fried until golden brown, this little bite was predictably oily. Nothing against the dish, rather, when you place a piece of white bread into hot oil, it'll act like a sponge. This was good, albeit a strange item for a dinner menu. The most visually stunning dish of the night was the Roast Alberta Beef Dragon Bone with ground biscuit powder. It was majestically plated with its delicious bone marrow beckoning for us to eat it. The meat and tendons were super tender and moist where it practically melted in my mouth. However, the flavour profile of the entire thing reminded me of a beef stew. A good beef stew though, just lacking some impact. It just didn't match its prominent appearance. The biscuit topping was an interesting mix of dry pork floss and ground biscuit. 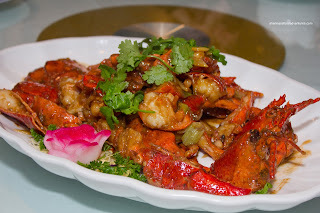 With all of the interesting things we had tried, it was pretty much anti-climatic when the Pan-Fried Double Lobsters with Amoy home-made sweet sauce arrived. Yah, pretty pathetic to not be excited about lobsters eh? Well, despite being completely full and not really all that enthusiastic, I still enjoyed the lobsters because of the flawless preparation. The lobsters were fried until just cooked while just the right amount of sweet and savoury sauce clung to each piece. Our final dish of the night was probably my favourite, which was the Roast Alberta Pork Chops with Amoy black vinegar sauce. There are times when the pork chops are either over or under-tenderized, but not in this case. The pork chops maintained a meaty texture while being tender at the same time. Furthermore, the sauce was rich, sweet and had a tartness that exhibited depth. And much like the lobsters, there was the perfect amount of sauce that clung to every chop. *Burp* Excuse me. What an incredible amount of eats! And I thought I had already seen it all on the Richmond portion of this Signature Dish Dining Festival tour. Once again, I'd like to thank the organizers for inviting me. 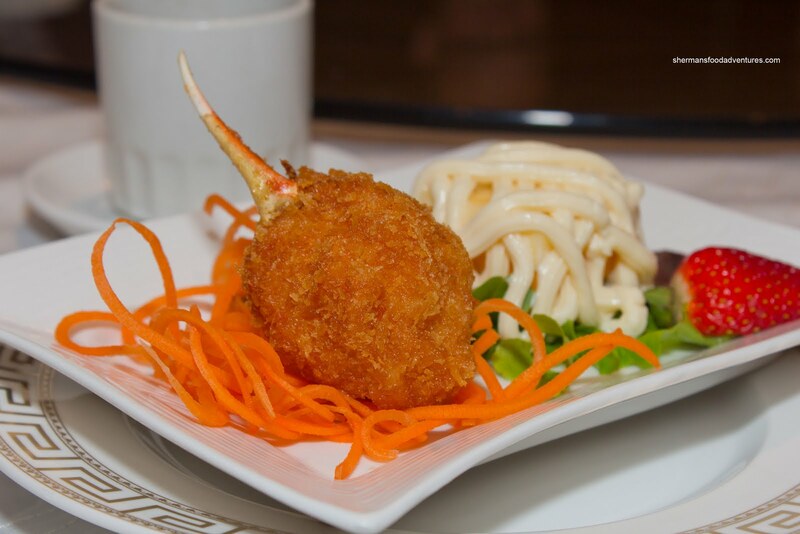 If you want to sample some of these dishes, check out the website and make a reservation.